The island of Raja Ampat in Indonesia possesses the world’s most diverse marine life. Making it a popular diving destination for dive enthusiasts, diving, and snorkelers all over the world. However, the island’s location and currents make Raja Ampat a trap for man-made waste caused by the increasing population internally and in neighboring countries, and poor waste management/ treatment practices. Who wouldn’t be turned off to find all kinds of waste while diving, when Raja Ampat is renowned to home 75 percent of all species around the world? Papua Paradise is an Eco-Resort where we take helping local communities grow and building the resort on a strategic and beneficial location for all kinds of wildlife beyond and under the ocean into account. We’ve seen plastic waste wash up ashore on Raja Ampat’s beaches, and it saddens us to hear guests find the island to have some of the world’s ‘untouched’ beaches untrue. However, hope is not lost: the local community and guests from around the world are successfully hosting “beach clean ups” to live up to Raja Ampat’s name of being the last paradise on Earth. Here are a few things you can do to preserve the island beauty as a guest visiting Raja Ampat: Don’t litter in Raja Ampat – if you bring it in, you take it out! 1. 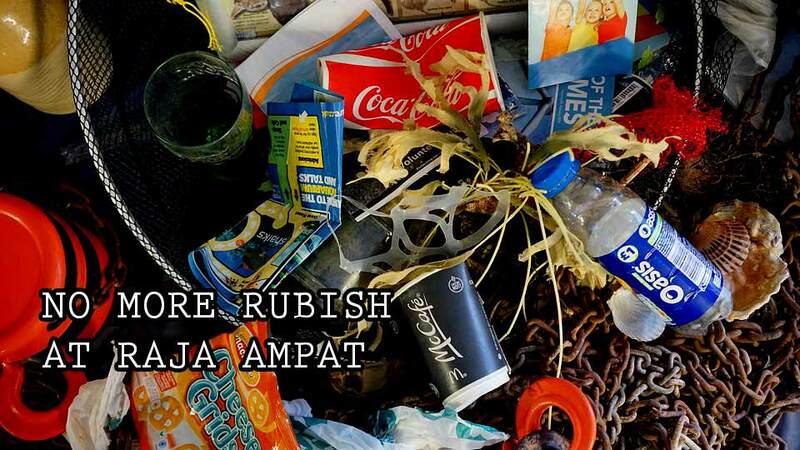 Don’t litter in Raja Ampat – if you bring it in, you take it out! There is only one way to know for sure how you won’t contribute to this growing problem: Take back all the non-bio degradable waste you’ve brought. This solution is simple, and safe as you never know if disposing of trash in the bins in the island of Waisai or Sorong, gets proper treatment or winds up in the ocean while you’re diving. Don’t purchase bottled water. Bring a refillable, BPA-free water bottle and drink local/ tap water after boiling or filtering it out (At Papua Paradise Resorts, we provide fresh drinking water to all our guests. So if you’d like a refill, let one of our staff members know). If you spot trash lying around or washed up ashore, collect it and ask your host how to dispose of it. Join the team: There are regular beach clean ups around the island. Jump in and lend a helping hand when you see a cleanup team at work. Clean up underwater: While you’re on a diving expedition, it’s common to find plastic on the reef. This is potentially harming the Raja Ampat Environment more compared to the trash you see ashore. If you happen to see small plastic trash while diving, grab them and keep them in your BCD pocket for disposal after the dive. While doing this, ensure you remain within your depth limit and that your buoyancy control is capable to permit the retrieval without reef damage. If you think that the lack of education and knowledge regarding waste treatment is contributing to most of these waste problems, you are totally wrong. These locals come from generations who were born and raised in this pristine environment. They have every reason to be the most concerned as they treat the island as their home. The locals at Raja Ampat are acutely aware of the value of their environment to support their way of as a reason they need to preserve it. Villages all over the islands have always practiced a traditional system of resource preservation. However, destructive practices such as blast and cyanide fishing, shark finning and targeted hunting of endangered species are still at large. Luckily, the Raja Ampat Marine Park are doing their best to secure an economic future that is based on eco-tourism and education rather than the unsustainable exploitation of their own home. You can support local communities by purchasing a Marine Park Entry Permit, patronizing and joining locally owned eco-tourism companies, and playing your part as an individual by minimizing your personal impact. Striving to make the island a better and cleaner place, Papua Paradise Resorts is always behind multiple eco organizations that have been formed locally and internationally. Stay with us to further support a sustainable island.